Anyway, I always remember him. He had kind of Linus hair, but darker and more of it, and more flattered, like he sported a perennial case of hat head. He never spoke. 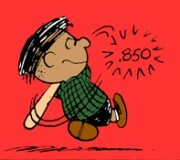 He briefly played on Charlie Brown's baseball team thanks to Peppermint Patty, and was an awesome player. He had lived in both New Mexico (a nod to his Mexican heritage, I guess) and North Dakota (a nod to his Swedish side). And just when Charlie Brown was agonizing that Peppermint Patty had taken over his team, she and Jose bailed for the team in their own neighborhood. And headed off for a meal of Swedish meatballs and tortillas. Which sounded so exotic to me at the time, but now just sounds yummy. The Peanuts wiki points out the (again, silent) appearance of a kid who has Jose's hair two years after his only real plotline. (Third panel.) After that, it was it. Adios, Jose. This sorta reminds me of the multi-cultural, but not very funny "Wee Pals" newspaper strip.